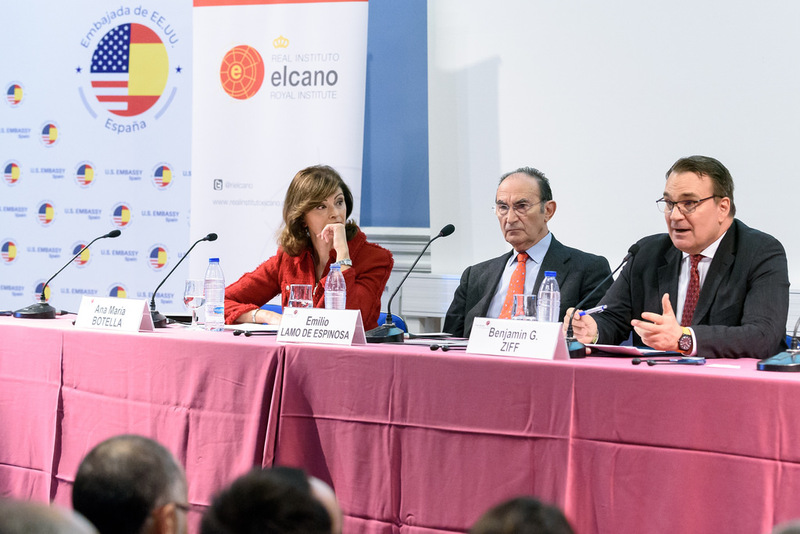 On November 14 2018, Elcano Royal Institute in Madrid held its sixth Forum on Terrorism and Radicalization. This year the focus was on prisons. The one day event was held in partnership with the US Embassy in Spain and saw a high number of top-level policymakers, terrorism experts and practitioners address the risk of prison radicalization from multiple perspectives and exchange a number of good practices and views on the outlook for the near future. European Eye on Radicalization attended the event and identified some crucial issues and insights that should interest our readers. Carola García-Calvo, Senior Analyst of the Violent Radicalisation and Global Terrorism Programme at the Elcano Royal Institute, illustrated the latest results of the intense activity carried out by the Elcano Institute in mapping the Spanish radical landscape. Addressing prison radicalization, she noted that prisons have been a relevant radicalization factor in six cases out of ten of individuals sentenced in Spain for terrorism-related offences, compared to four out of ten cases where mosques or other places of worship played a significant role. This is a crucial notion, highlighted by different speakers during the entire forum. Daniel Koehler, Director of the German Institute on Radicalization and De-radicalization Studies (GIRDS), explained that CVE programs do have a series of common characteristics and choices that should be made, such as whether or not to include ideology, carrying out passive or active prevention campaigns, and the degree of state involvement. However, Dr. Koehler emphasized that every CVE program is necessarily shaped by its context and different interventions should be designed and implemented according to the stage of radicalization the individual has reached. Similarly, Fernando Reinares, Senior Analyst and Director of the Violent Radicalization and Global Terrorism Program at the Elcano Royal Institute, mentioned the evolution of the Spanish experience, in which the country abandoned the concentration formula after the conflict with the Basque group ETA. Hilla Weizman, Major Assistant to the Head of Intelligence Division of the Israel Prison Service (IPS), gave further informative insights about the ability of CVE to adapt to different circumstances. She categorized radical inmates in three groups: Salafists and inmates with a good knowledge of theology, returning foreign terrorist fighters, and young, less religiously educated radicals. After opting for the separation of all the radical groups from other offenders, the Israeli Prison Service adopted a highly experimental approach and found that it was more beneficial to integrate returnees and less religiously educated radicals among common offenders and non-radical inmates, tapping into the general aversion of the latter for radicalism and hoping that secular prisoners could be a bulwark against further radicalization. In this respect, Dr. Lorenzo Vidino, Director of the Program on Extremism at George Washington University, warned that policymakers and the CVE community do not have to reach a universal consensus on whether separation, concentration, or hybrid models are the best option. The choice depends on multiple factors, such as the availability of resources, the profiles of group members, the country in which the intervention takes place, and the radicalization phase that is being addressed. For instance, concentration has worked fairly well in the Netherlands, whereas for the IRA in the UK it was an unsuccessful policy. Using former radicals is another context-bound choice and CVE actors are far from having reached an agreement on a well-defined strategy. A number of de-radicalization and rehabilitation programs – especially in countries beyond Europe such as Indonesia, Malaysia, Singapore, and some states of the MENA region – opt for deep involvement of de-radicalized, charismatic figures who can create a productive dialogue with younger radicals. Other interventions tend to exclude this resource, as El-Mostafa Rezrazi, Senior Fellow of the OCP Policy Centre and Executive Director of the Moroccan Observatory on Extremism and Violence, clearly highlighted. Throughout the Forum, multiple experts stressed the in fieri nature of prevention and Countering Violent Extremism, mentioning the progress and adaptation that this field has been undergoing in their own countries and abroad. In particular, in his keynote speech Radicalization and Deradicalization in Prison: the American Experience and Challenges Common to All Western Countries, Lorenzo Vidino explained that just ten years ago the debate about radicalization behind bars was focused only on the notion of contagion and choosing between concentration or separation of radicalized individuals in prison. By contrast, at present, especially in Europe, the debate has progressed dramatically. We are starting to see prisons partly as an opportunity – for prevention and de-radicalization – and not only as a challenge. The relevance of continuous monitoring and assessment of CVE programs, aimed at evaluating their effectiveness, was seen as imperative by all the experts involved in the Forum. Thomas Renard, Senior Research Fellow at the Egmont Royal Institute for International Relations in Brussels, stressed the importance of designing new risk-assessment tools, as Belgium has been doing in recent years. Simultaneously, however, there are inmates who are not known for being radicalized while they are in prison, and this is one of the biggest challenges for a successful CVE strategy. The magnifying effect should be avoided. Thomas Renard noted that, even in high-risk countries like Belgium, which currently has over 10,000 inmates, and even with the worst estimates, only 4-5% of the prison population is at risk of radicalization. Moreover, the context changes, so even if old and new charismatic individuals try to radicalize other people inside and outside prisons they may not find the same echoes and support that they found in the period from 2014 to 2015. At the same time, however, Fernando Reinares warned that many fighters returning from Syria reinvented themselves as recruiters and energizing actors for homegrown cells in Europe. In her quantitative analysis, Carola García-Calvo informed the Forum that by 2026 no fewer than 73 jihadists in Spanish prisons will have served their sentences, which is undoubtedly a significant number. Another complex issue that will need to be addressed in depth, according to Daniel Koehler, is the protection of individuals who are de-radicalizing from the high risk of retaliation inside and outside prisons. For this reason, internal intelligence is absolutely crucial. Turning back to the keynote speech, Lorenzo Vidino warned that the next few years will see both a massive wave of arrests – due to the flow of returning foreign terrorist fighters – and the beginning of the release of al-Qaeda-linked radicals who had been jailed in the years after 9/11, which is an issue facing both Europe and the United States. A further trend forecasted by more than one speaker is the increasing involvement of specific groups in radicalization processes, namely women, minors, and individuals with mental health problems. In conclusion, almost all the EU countries now have Countering Violent Extremism strategies, but there is always room for improvement and for better awareness of the dynamics taking place inside and outside prisons.